Been a while since I’ve posted/active on the the forum, mostly cause I broke my phone. The old iPhone 4s I had to use couldn’t handle Tapatalk app. Last June I had to move my old 40 gal reef tank to a new apartment and then ended up moving it again in November, it sucked! 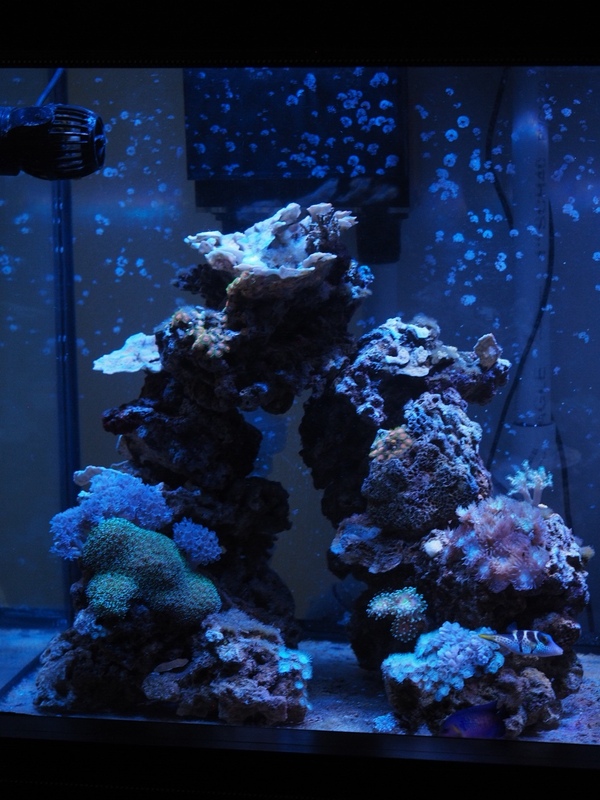 Things went south with excess nutrients/algae and coral decline. Moving that much certainly didn’t help things but I Mostly attributed it to my DIY sump and overflow setup. Not researching enough about pvc diameter and flow led me to not having enough turnover to properly feed my in sump skimmer while carbon dosing, leading to nutrient buildup. 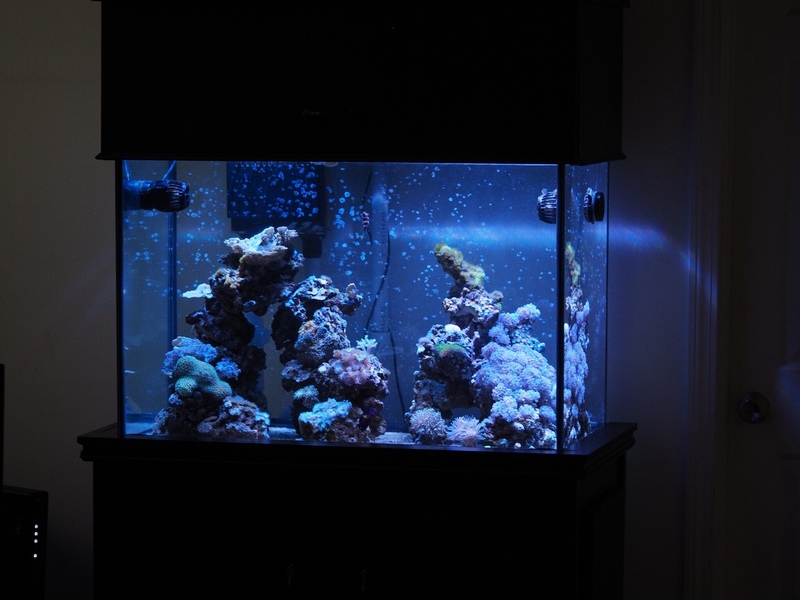 With another move in February to Portsmouth NH I began planning my upgrade, a 65 gallon. I liked the footprint of my 40 but the height didn’t allow for the rockscape I wanted. A 75 gallon was to big/long but had the height, but the 65 gave me the best of both worlds, extra height with roughly the same 40g footprint. Stand was built with 2x3 boards and 1/4 side paneling, 3/4 inch plywood for the doors and the hood. The back is open for good air flow and the two sides have hinges panels for easy access under the stand. Also allows for removal of sump for maintenance/cleaning. Having time for my move to Portsmouth and move out, made it much easier and less chaotic. Come move in I setup the new 65 gal, and got everything running. then the next day I broke down my old 40g moved livestock and rock to new tank and it’s been pretty smooth since then. 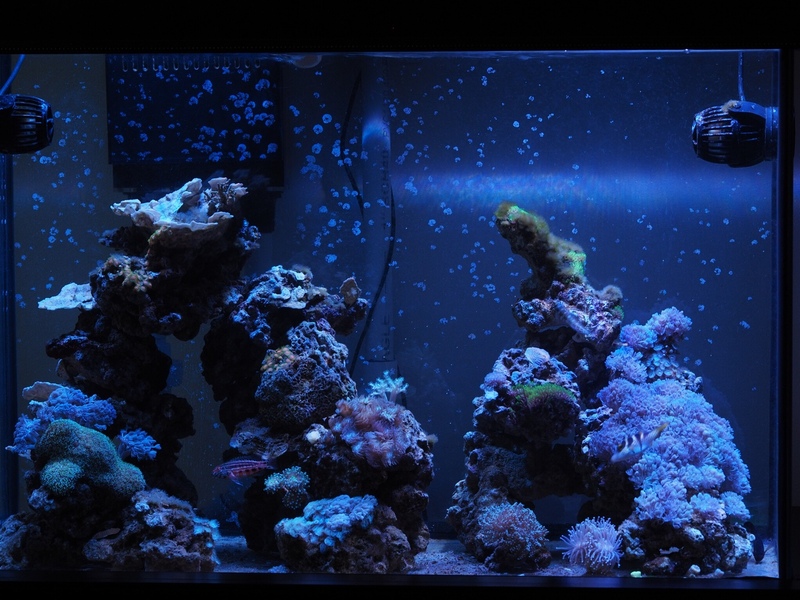 As for the future of the tank I am going to sell the hydra 26 HD and put in another prime HD. They have a different look/spectrum when linked, prime is more purple and 26 more blue. The 26 is to powerful for what I need as well. Can’t seem to make my monti caps happy under the 26. They have been severely bleached for months but some how holding on and growing. Algae left over from the 40g has been decreasing with vinegar dosing which works much better with the more efficient sump/overflow. Having a bigger sump is awesome, extra rock and frag rack fit nicely. dosing vinegar and traces has mostly replaced water changes. Have only done two 5 gallon changes since moving in February, and things have never been better, overall maintenance time is way lower too! Also Planning on trading/selling big Xenia rock in the future and likely pick up bta once things have settled in more. Been a few months but tank is back on track and things are on the upswing. So after trying the reduced water change method (about 20%/every other month) I’m back to 10gal every week. My Xenia patch melted away after I rearranged some rock work! Oh well the stuff can get to crazy sometimes. Reduced water change with vinegar dosing worked fine for a few months but then dosing alk/mag/ca became a nightmare as levels would shift very quickly. Maybe the trace elements got to depleted throwing things out of whack? Either way the weekly water changes made instant difference. No dosing except for small amount of vinegar. Will start in the next few weeks and will try getting away with biweekly water changes. Reduced bio load too, Valentino puffer and lantern basket had to go. Between the two pigs they would eat 5 whole krill every other day! Exchanged for a twin spot hogfish. Will only get one more smaller fish in the future, still undecided, clown,cardinal,royal gramma, who knows? Added chaeto and lower vinegar dosing, chaeto growing well. Tank algae is reducing. 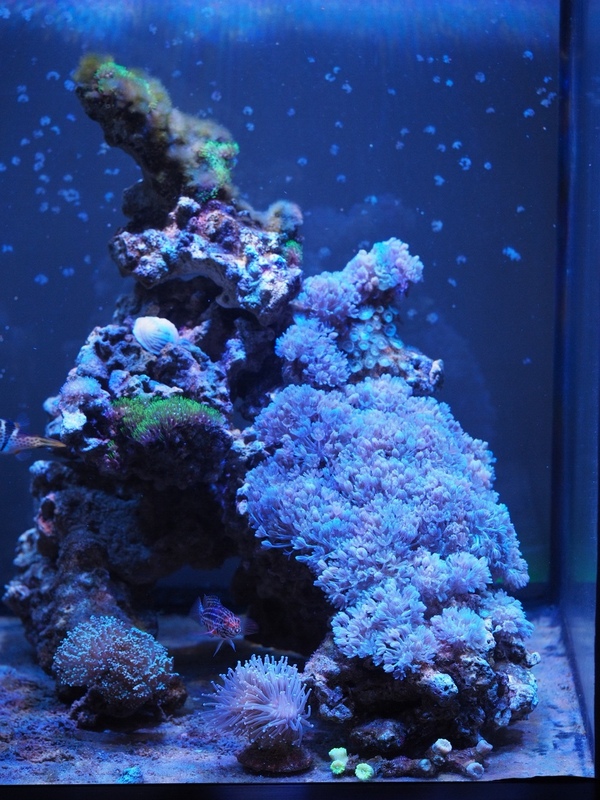 Monti caps are coloring back up and corals are growing good again!